The Aran Islands are one of Ireland’s most unique destinations, but most visitors only admire them from afar. This round-trip ferry service from Doolin to Inis Oírr includes free time to explore the island independently and spectacular views of the Cliffs of Moher. While most tours only admire Inis Oírr from afar, this one gives you free time to explore the island. Make your own way to Doolin Pier and use your prepaid ferry tickets to head straight aboard. Set sail on the journey to Inis Oírr, the smallest of the Aran Islands, and enjoy spectacular views across Galway Bay as you cruise out across the Atlantic. On arrival in Inis Oírr, you’ll have a few hours to explore the island at your own pace. 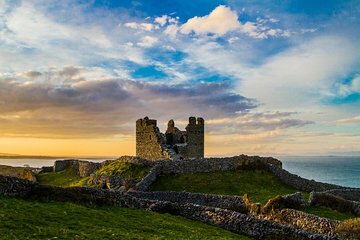 Perhaps hire a bike, join a mini-bus tour, or ride a pony trap (own expense) around the island, and take in sights such as O’Brien’s Castle, St. Kevin’s Church, the Plassey Shipwreck, and the Lighthouse. Make your way back to the pier in time for the return ferry and cruise back beneath the towering Cliffs of Moher, one of Ireland’s most impressive natural wonders. As you glide beneath the 700-foot (214-meter) high cliffs and the Great Sea Stack (Branaunmore), look out for sea birds such as puffins, guillemots, and razorbills. Your tour ends back at Doolin Pier. Please note: Ferries run daily from March to October. All sailings are weather dependent so please contact us in advance should you have any queries about sailing conditions. Very rude guide. His name was Shin. The weather was not cooperating.... which was what it was... but the guide started taking us to off planned places that the majority of the bus did not want to go to. 9 of us ended up leaving the tour mid-tour and finding our own way back. I felt like we were held hostage on this bus on windy roads. Every stop was 40 mins or less and the rides between stops were over 1 hour. We never had time outside of bus. Dont book this tour! Find a different one. Shin was rude and acted like my opinion was not worth hearing. He tried to treat the group like naughty kids. It was demeaning and repugnant. We enjoyed the tour very much. The staff at the ferry was great - we arrived almost late and they were quick to greet us and get our ticket ready so we made the boat. When we got to the island, we took a horse-drawn carriage tour - we thought this was a great way to see a lot more than we would have if we were just walking. Also the guide tells you about the island and the sights. This is an additional fee so bring cash for that. There are a few cafes and a shop on the island as well, so best to come prepared for those expenses as well - food was very reasonably priced at the cafe up the hill forgot the name. The return ferry trip to view the cliffs was amazing. Someone said to sit to the right of the ferry, which is best once you are right up to the cliffs, but it really doesn't matter as you get a very impressive view on the left side when approaching. A fantastic experience, and we lucked out with a great weather day as well. We booked this tour with high hopes of seeing sharks off the coast - no man, woman or child - or even a fabulous Captain can guarantee Mother Nature will cooperate - and on this day, she didn't. No sharks and rain - loads of rain. But that did not hamper our fun. Captain Paddy made us feel safe out on the seas and shared great stories and showed the great sights of the coast. My twin teen girls thoroughly enjoyed the trip and so did I.... Great day. I thoroughly enjoyed this side trip to Inis Oirr Island! Unfortunately however, the instructions as to where to get our boarding pass was a little vague. We stopped at the first small parking lot which had an office for a competitor ferry - this was a mistake! There is another parking lot at the end of the road which was where all the ferry offices are located. The first parking lot only has one ferry company and they took our voucher and gave us a ticket for their ferry. Although the ride was nice, the ferry wasn't. I'm not picky, so I went with the flow but I felt badly that the correct company did not get my business. The nicer ferry would have been a plus but the ride isn't long to the islands and we didn't want to fuss. On the island, we hired one of the horse carriages and our guide and his dog were delightful! He recommended a place to eat and a nice walk as well. The ride under the Cliffs of Moher were spectacular and the guide on the ferry had plenty of interesting information.